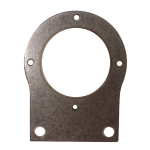 This stainless steel plate enables mounting Basler ace IP67 cameras. The camera's optical axis can be rotated in 90 degree increments. Through-holes for attaching to machine are located 1.75" oc and will clear M8 fasteners. Includes four M5 x 10 mm button-head hex screws. Please see the BTIS103 assembly for mounting camera on a 1" rod.